The process for adding a Satellite host provider host is almost identical to that of adding a Red Hat Enterprise Linux host except for the method by which the host is identified in the Manager. The following procedure outlines how to add a host provided by a Satellite host provider. Click the Hosts resource tab to list the hosts in the results list. Click New to open the New Host window. Use the drop-down menu to select the Host Cluster for the new host. Select the Foreman/Satellite check box to display the options for adding a Satellite host provider host and select the provider from which the host is to be added. Select either Discovered Hosts or Provisioned Hosts. Discovered Hosts (default option): Select the host, host group, and compute resources from the drop-down lists. Provisioned Hosts: Select a host from the Providers Hosts drop-down list. Any details regarding the host that can be retrieved from the external provider are automatically set, and can be edited as desired. Enter the Name, Address, and SSH Port (Provisioned Hosts only) of the new host. Select an authentication method to use with the host. Copy the key displayed in the SSH PublicKey field to /root/.ssh/authorized_hosts on the host to use public key authentication (Provisioned Hosts only). You have now completed the mandatory steps to add a Red Hat Enterprise Linux host. Click the Advanced Parameters drop-down button to show the advanced host settings. You can configure the Power Management, SPM, Console, and Network Provider using the applicable tabs now; however, as these are not fundamental to adding a Red Hat Enterprise Linux host, they are not covered in this procedure. Click OK to add the host and close the window. The new host displays in the list of hosts with a status of Installing, and you can view the progress of the installation in the details pane. After installation is complete, the status will update to Reboot. The host must be activated for the status to change to Up. Red Hat Enterprise Virtualization can be configured to view errata from Red Hat Satellite. This enables the host administrator to receive updates about available errata, and their importance, in the same dashboard used to manage host configuration. For more information about Red Hat Satellite see the Red Hat Satellite User Guide. Hosts are identified in the Satellite server by their FQDN. Hosts added using an IP address will not be able to report errata. This ensures that an external content host ID does not need to be maintained in Red Hat Enterprise Virtualization. The Satellite account used to manage the host must have Administrator permissions and a default organization set. Add the Satellite server as an external provider. See Section 11.2.2, “Adding a Red Hat Satellite Instance for Host Provisioning” for more information. Associate the required host with the Satellite server. The host must be registered to the Satellite server and have the katello-agent package installed. In the Hosts tab, select the host in the results list. Click Edit to open the Edit Host window. Check the Use Foreman/Satellite checkbox. Select the required Satellite server from the drop-down list. The host is now configured to show the available errata, and their importance, in the same dashboard used to manage host configuration. These settings apply when editing the details of a host or adding new Red Hat Enterprise Linux hosts and Satellite host provider hosts. The General settings table contains the information required on the General tab of the New Host or Edit Host window. The data center to which the host belongs. Red Hat Enterprise Virtualization Hypervisor hosts cannot be added to Gluster-enabled clusters. The cluster to which the host belongs. Discovered Hosts - A drop-down list that is populated with the name of Satellite hosts discovered by the engine. Host Groups -A drop-down list of host groups available. Compute Resources - A drop-down list of hypervisors to provide compute resources. Providers Hosts - A drop-down list that is populated with the name of hosts provided by the selected external provider. The entries in this list are filtered in accordance with any search queries that have been input in the Provider search filter. Provider search filter - A text field that allows you to search for hosts provided by the selected external provider. This option is provider-specific; see provider documentation for details on forming search queries for specific providers. 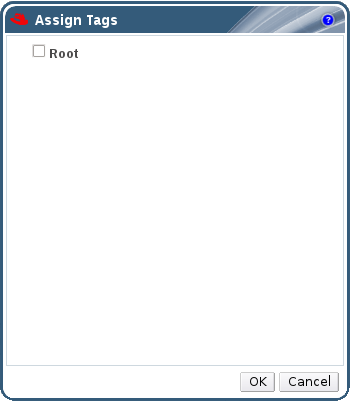 Leave this field blank to view all available hosts. A field for adding plain text, human-readable comments regarding the host. The IP address, or resolvable hostname of the host. The password of the host's root user. This can only be given when you add the host; it cannot be edited afterwards. Copy the contents in the text box to the /root/.known_hosts file on the host to use the Manager's ssh key instead of using a password to authenticate with the host. When adding a new host, the Manager can open the required ports on the host's firewall. This is enabled by default. This is an Advanced Parameter. This is enabled by default. This is an Advanced Parameter. You can fetch the host's SSH fingerprint, and compare it with the fingerprint you expect the host to return, ensuring that they match. This is an Advanced Parameter. The Power Management settings table contains the information required on the Power Management tab of the New Host or Edit Host windows. Enables power management on the host. Select this check box to enable the rest of the fields in the Power Management tab. Prevents the host from fencing while performing a kernel crash dump, so that the crash dump is not interrupted. From Red Hat Enterprise Linux 6.6 and 7.1 onwards, Kdump is available by default. If kdump is available on the host, but its configuration is not valid (the kdump service cannot be started), enabling Kdump integration will cause the host (re)installation to fail. If this is the case, see Section 6.6.4, “fence_kdump Advanced Configuration”. Power management is controlled by the Scheduling Policy of the host's cluster. If power management is enabled and the defined low utilization value is reached, the Manager will power down the host machine, and restart it again when load balancing requires or there are not enough free hosts in the cluster. Select this check box to disable policy control. Lists the host's fence agents. Fence agents can be sequential, concurrent, or a mix of both. If fence agents are used sequentially, the primary agent is used first to stop or start a host, and if it fails, the secondary agent is used. If fence agents are used concurrently, both fence agents have to respond to the Stop command for the host to be stopped; if one agent responds to the Start command, the host will go up. Fence agents are sequential by default. Use the up and down buttons to change the sequence in which the fence agents are used. To make two fence agents concurrent, select one fence agent from the Concurrent with drop-down list next to the other fence agent. Additional fence agents can be added to the group of concurrent fence agents by selecting the group from the Concurrent with drop-down list next to the additional fence agent. Click the plus (+) button to add a new fence agent. The Edit fence agent window opens. See the table below for more information on the fields in this window. By default, specifies that the Manager will search for a fencing proxy within the same cluster as the host, and if no fencing proxy is found, the Manager will search in the same dc (data center). Use the up and down buttons to change the sequence in which these resources are used. This field is available under Advanced Parameters. The following table contains the information required in the Edit fence agent window. The address to access your host's power management device. Either a resolvable hostname or an IP address. User account with which to access the power management device. You can set up a user on the device, or use the default user. Password for the user accessing the power management device. The type of power management device in your host. apc - APC MasterSwitch network power switch. Not for use with APC 5.x power switch devices. apc_snmp - Use with APC 5.x power switch devices. bladecenter - IBM Bladecenter Remote Supervisor Adapter. cisco_ucs - Cisco Unified Computing System. drac5 - Dell Remote Access Controller for Dell computers. drac7 - Dell Remote Access Controller for Dell computers. eps - ePowerSwitch 8M+ network power switch. ilo, ilo2, ilo3, ilo4 - HP Integrated Lights-Out. ipmilan - Intelligent Platform Management Interface and Sun Integrated Lights Out Management devices. rsa - IBM Remote Supervisor Adapter. rsb - Fujitsu-Siemens RSB management interface. wti - WTI Network Power Switch. The port number used by the power management device to communicate with the host. The number used to identify the blade of the power management device. The service profile name used to identify the blade of the power management device. This field appears instead of Slot when the device type is cisco_ucs. Power management device specific options. Enter these as 'key=value'. See the documentation of your host's power management device for the options available. For Red Hat Enterprise Linux 7 hosts, if you are using cisco_ucs as the power management device, you also need to append ssl_insecure=1 to the Options field. Select this check box to allow the power management device to connect securely to the host. This can be done via ssh, ssl, or other authentication protocols depending on the power management agent. The SPM settings table details the information required on the SPM tab of the New Host or Edit Host window. Defines the likelihood that the host will be given the role of Storage Pool Manager (SPM). The options are Low, Normal, and High priority. Low priority means that there is a reduced likelihood of the host being assigned the role of SPM, and High priority means there is an increased likelihood. The default setting is Normal. The Console settings table details the information required on the Console tab of the New Host or Edit Host window. Select this check box to override the display addresses of the host. This feature is useful in a case where the hosts are defined by internal IP and are behind a NAT firewall. When a user connects to a virtual machine from outside of the internal network, instead of returning the private address of the host on which the virtual machine is running, the machine returns a public IP or FQDN (which is resolved in the external network to the public IP). The display address specified here will be used for all virtual machines running on this host. The address must be in the format of a fully qualified domain name or IP. Configure your host power management device settings to perform host life-cycle operations (stop, start, restart) from the Administration Portal. It is necessary to configure host power management in order to utilize host high availability and virtual machine high availability. Ensure that your host is in maintenance mode before configuring power management settings. Otherwise, all running virtual machines on that host will be stopped ungracefully upon restarting the host, which can cause disruptions in production environments. A warning dialog will appear if you have not correctly set your host to maintenance mode. Click the Power Management tab to display the Power Management settings. Select the Enable Power Management check box to enable the fields. Select the Kdump integration check box to prevent the host from fencing while performing a kernel crash dump. When you enable Kdump integration on an existing host, the host must be reinstalled for kdump to be configured. See Section 6.5.10, “Reinstalling Virtualization Hosts”. Optionally, select the Disable policy control of power management check box if you do not want your host's power management to be controlled by the Scheduling Policy of the host's cluster. Click the plus (+) button to add a new power management device. The Edit fence agent window opens. Enter the Address, User Name, and Password of the power management device into the appropriate fields. Select the power management device Type from the drop-down list. Enter the SSH Port number used by the power management device to communicate with the host. Enter the Slot number used to identify the blade of the power management device. Enter the Options for the power management device. Use a comma-separated list of 'key=value' entries. Select the Secure check box to enable the power management device to connect securely to the host. Click Test to ensure the settings are correct. Test Succeeded, Host Status is: on will display upon successful verification. Click OK to close the Edit fence agent window. In the Power Management tab, optionally expand the Advanced Parameters and use the up and down buttons to specify the order in which the Manager will search the host's cluster and dc (datacenter) for a fencing proxy. The Power Management drop-down menu is now enabled in the Administration Portal. The Storage Pool Manager (SPM) is a management role given to one of the hosts in a data center to maintain access control over the storage domains. The SPM must always be available, and the SPM role will be assigned to another host if the SPM host becomes unavailable. As the SPM role uses some of the host's available resources, it is important to prioritize hosts that can afford the resources. The Storage Pool Manager (SPM) priority setting of a host alters the likelihood of the host being assigned the SPM role: a host with high SPM priority will be assigned the SPM role before a host with low SPM priority. Click the Hosts resource tab, and select a host from the results list. Click the SPM tab to display the SPM Priority settings. Use the radio buttons to select the appropriate SPM priority for the host. You have configured the SPM priority of the host. Many common maintenance tasks, including network configuration and deployment of software updates, require that hosts be placed into maintenance mode. Hosts should be placed into maintenance mode before any event that might cause VDSM to stop working properly, such as a reboot, or issues with networking or storage. When a host is placed into maintenance mode the Red Hat Enterprise Virtualization Manager attempts to migrate all running virtual machines to alternative hosts. The standard prerequisites for live migration apply, in particular there must be at least one active host in the cluster with capacity to run the migrated virtual machines. Click the Hosts resource tab, and select the desired host. Click Maintenance to open the Maintenance Host(s) confirmation window. Optionally, enter a Reason for moving the host into maintenance mode in the Maintenance Host(s) confirmation window. This allows you to provide an explanation for the maintenance, which will appear in the logs and when the host is activated again. The host maintenance Reason field will only appear if it has been enabled in the cluster settings. See Section 4.2.2.1, “General Cluster Settings Explained” for more information. All running virtual machines are migrated to alternative hosts. If the host is the Storage Pool Manager (SPM), the SPM role is migrated to another host. The Status field of the host changes to Preparing for Maintenance, and finally Maintenance when the operation completes successfully. VDSM does not stop while the host is in maintenance mode. If migration fails on any virtual machine, click Activate on the host to stop the operation placing it into maintenance mode, then click Cancel Migration on the virtual machine to stop the migration. A host that has been placed into maintenance mode, or recently added to the environment, must be activated before it can be used. Activation may fail if the host is not ready; ensure that all tasks are complete before attempting to activate the host. Click the Hosts resources tab and select the host. The host status changes to Unassigned, and finally Up when the operation is complete. Virtual machines can now run on the host. Virtual machines that were migrated off the host when it was placed into maintenance mode are not automatically migrated back to the host when it is activated, but can be migrated manually. If the host was the Storage Pool Manager (SPM) before being placed into maintenance mode, the SPM role does not return automatically when the host is activated. Remove a host from your virtualized environment. In the Administration Portal, click the Hosts resource tab and select the host in the results list. Click Remove to open the Remove Host(s) confirmation window. Select the Force Remove check box if the host is part of a Red Hat Gluster Storage cluster and has volume bricks on it, or if the host is non-responsive. Your host has been removed from the environment and is no longer visible in the Hosts tab. Reinstall Red Hat Enterprise Virtualization Hypervisors and Red Hat Enterprise Linux hosts from the Administration Portal. Use this procedure to reinstall hypervisors from the same version of the hypervisor ISO image from which it is currently installed; the procedure reinstalls VDSM on Red Hat Enterprise Linux Hosts. This includes stopping and restarting the hypervisor. If migration is enabled at cluster level, virtual machines are automatically migrated to another host in the cluster; as a result, it is recommended that host reinstalls are performed at a time when the hypervisor's usage is relatively low. The cluster to which the hypervisor belongs must have sufficient memory reserve in order for its hosts to perform maintenance. Moving a host with live virtual machines to maintenance in a cluster that lacks sufficient memory causes the virtual machine migration operation to hang and then fail. You can reduce the memory usage of this operation by shutting down some or all virtual machines before moving the host to maintenance. Ensure that the cluster contains more than one host before performing a reinstall. Do not attempt to reinstall all the hosts at the same time, as one host must remain available to perform Storage Pool Manager (SPM) tasks. Use the Hosts resource tab, tree mode, or the search function to find and select the host in the results list. Click Maintenance. If migration is enabled at cluster level, any virtual machines running on the host are migrated to other hosts. If the host is the SPM, this function is moved to another host. The status of the host changes as it enters maintenance mode. Click Reinstall to open the Install Host window. Click OK to reinstall the host. Once successfully reinstalled, the host displays a status of Up. Any virtual machines that were migrated off the host, are at this point able to be migrated back to it. After a Red Hat Enterprise Virtualization Hypervisor is successfully registered to the Red Hat Enterprise Virtualization Manager and then reinstalled, it may erroneously appear in the Administration Portal with the status of Install Failed. Click Activate, and the Hypervisor will change to an Up status and be ready for use. You can use tags to store information about your hosts. You can then search for hosts based on tags. Click Assign Tags to open the Assign Tags window. The Assign Tags window lists all available tags. Select the check boxes of applicable tags. Click OK to assign the tags and close the window. You have added extra, searchable information about your host as tags. Click the General tab in the details pane. Click the Errata sub-tab in the General tab. To view further details about the host's health status, select the host and click the Events sub-tab. The host's health status can also be viewed using the REST API. A GET request on a host will include the external_status element, which contains the health status. You can set a host's health status in the REST API via the events collection. For more information, see Adding Events in the REST API Guide. You can view the host devices for each host in the details pane. If the host has been configured for direct device assignment, these devices can be directly attached to virtual machines for improved performance. For more information on the hardware requirements for direct device assignment, see Additional Hardware Considerations for Using Device Assignment in Red Hat Enterprise Virtualization Hardware Considerations for Implementing SR-IOV. For more information on configuring the host for direct device assignment, see Configuring a Hypervisor Host for PCI Passthrough in the Installation Guide. For more information on attaching host devices to virtual machines, see Host Devices in the Virtual Machine Management Guide. Use the Hosts resource tab, tree mode, or the search function to find and select a host from the results list. Click the Host Devices tab in the details pane. The details pane lists the details of the host devices, including whether the device is attached to a virtual machine, and currently in use by that virtual machine. The Graphics Processing Unit (GPU) device from a host can be directly assigned to a virtual machine. Before this can be achieved, both the host and the virtual machine require amendments to their grub configuration files. Both machines also require reboot for the changes to take effect. This procedure is relevant for hosts with either x86_64 or ppc64le architecture. For more information on the hardware requirements for direct device assignment, see PCI Device Requirements in the Installation Guide. This procedure assumes that the server has been configured properly to allow for device assignment. See Configuring a Hypervisor Host for PCI Passthrough in the Installation Guide. Log in to the host server and find the device vendor ID:product ID. In this example, the IDs are 10de:13ba and 10de:0fbc. Edit the grub configuration file and append pci-stub.ids=xxxx:xxxx to the end of the GRUB_CMDLINE_LINUX line. GRUB_CMDLINE_LINUX="nofb splash=quiet console=tty0 ... pci-stub.ids=10de:13ba,10de:0fbc"
Blacklist the corresponding drivers on the host. In this example, nVidia's nouveau driver is being blacklisted by an additional amendment to the GRUB_CMDLINE_LINUX line. GRUB_CMDLINE_LINUX="nofb splash=quiet console=tty0 ... pci-stub.ids=10de:13ba,10de:0fbc rdblacklist=nouveau"
Save the grub configuration file. Proceed to the next procedure to configure GPU passthrough on the guest system side. GRUB_CMDLINE_LINUX="nofb splash=quiet console=tty0 ... rdblacklist=nouveau"
Locate the GPU BusID. In this example, is BusID is 00:09.0. Download and install the corresponding drivers for the device. For example, for Nvidia drivers, go to NVIDIA Driver Downloads. The host GPU can now be directly assigned to the prepared virtual machine. For more information on assigning host devices to virtual machines, see Host Devices in the Virtual Machine Management Guide.